Strider ST-3 or ST-4: Which is the best choice? Strider is a bike company in the United States well known for its balance bikes, and the balance bike competitions it organizes. The company is an advocate of the balance bike, and believe in the balance first and pedal later rule when teaching children how to bike. Strider’s latest model (Strider 12) is reviewed here. In 2013, Strider released its latest and improved balance bike model – ST3 model. The one year gap between both models makes one wonder how much of a difference there really is between the two. Below we break down several important features and compare the two different models. The overall weight of both bikes is 6.5 pounds. Both are designed with handgrips and seats, especially for smaller children. Therefore, both bikes allow riders as young as 18 months to use them. Being light in weight helps allow for kids to carry and handle them easier than heavier models. The ST3 has a maximum weight capacity of 60 pounds in comparison to the maximum weight capacity of 50 pounds on the ST4. The difference in the carrying load is not great, but older, or heavier riders may find the ST3 more manageable as a result. One of the main differences between the two models is the change in the bearings. While the ST3 uses cone and cup bearings, the ST4 uses sealed bearings. 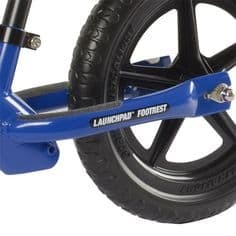 With sealed bearings, there is less chance of dirt getting into the bearings system thereby preventing any disruption to the smooth ride often noticed by children using the bike. Cone and cup bearings still provide a smooth wheel rotation, but they are not as maintenance-free as the sealed bearings. Additionally, the treads on in the newer model were redesigned for better traction. One of the complaints noted against the ST3 was that the wheel tread did not offer the rider great traction on non-paved surfaces. The new treads on the ST4 are supposedly better at handling off-road excursions. The ST4 sports a brand new Strider graphic design along the frame. This is protected with a new powder coat finish that prevents scratches on the frame. The seat and quick release clamps are also finished with this scratch-resistant coating. In general, when comparing the features between both sets of bikes there aren’t many differences. Most importantly the improved features on the ST4 do not affect the young rider’s overall riding experience. Both models have adjustable seat posts with optional extendable posts so they can easily accommodate children from 18 months to 5 years old. Since both models come standard with the smaller handgrips and saddles, they both pose the same problems to older and larger riders, who will require buying a larger seat, and larger handgrips eventually.